What is that something? Well, it is the targets for 10yr & 30yr bond yields we laid out 4-5 months ago in a bearish case for bonds; you know, back when everyone didn’t hate bonds as is currently the case under the much more recent expert guidance of Bill, Ray and Paul? It might as well have been Ringo, George and Paul making the call. 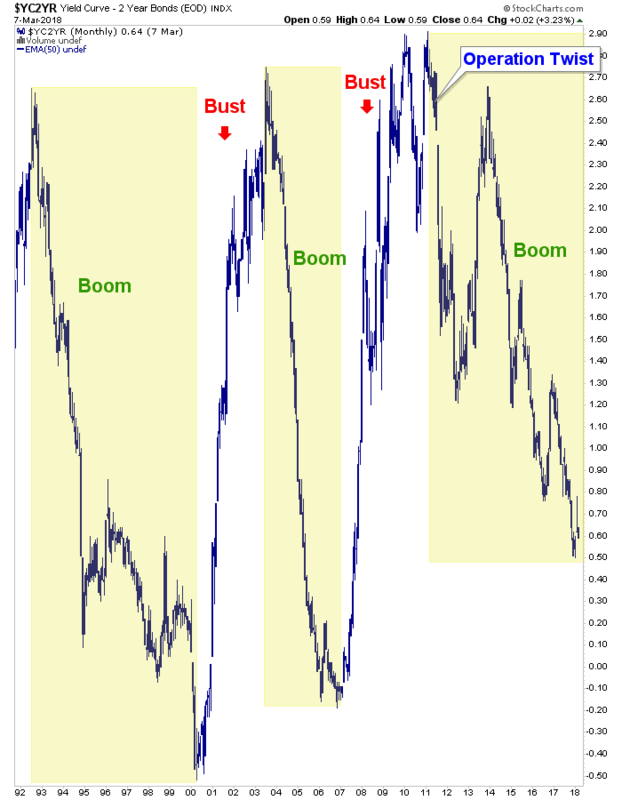 I am not trying to come off as a contrarian bond bull, deflationist. There are very valid reasons to be open to if not expect a new and secular bond bear market. But with the yields at our targets, which were established for a reason (being caution) and with the financial eggheads fully in unison, it has come time for caution on the bond bear stance and at least some aspects of a stock bull stance. For my part, as written on several occasions in NFTRH and in public, Treasury bonds (T bills, 1-3yr, 3-7yr & 7-10yr) are now playing a balancing role in my portfolios and spitting out monthly income to boot. Is this an investment? Absolutely not. Not with Treasury bonds overseen by the chronic debtor AKA the US government and manipulated by the chronic inflator, the Federal Reserve. But the long-term ‘Continuum’ chart has been kind of obvious, don’t you think? While the 10yr has hit target, the 30yr dwells just under its historical limiter (and target) at 3.3% (the monthly EMA 100). At the same time the long bond, which goes opposite its yield, has come down to its EMA 100, which has historically limited declines. This time different? Maybe. There are no absolutes. But this is a risk vs. reward business. The bottom line on Amigo #2 is that with the ‘inflation trade’ that got going in December, yields would rise along with the bullish backdrop. But if the limiter once again lives up to its name, that which was most bullish during said ‘inflation trade’ would be at risk. Since the macro moves at a snail’s pace, this is not necessarily bearish yet; but it would demand rotation and rebalancing for right minded casino patrons. Moving on, let’s see where Amigo #1 is at. He’s the one on the left in the picture above. He’s utterly euphoric, out there riding along the foothills in the warm Mexican sun. Not a care in the world… just look at that goofy, blissful expression on his face. Indeed, despite a hard spill in February the uptrend in SPX vs. Gold is intact and the target of 2.50 is still valid. But this is a maturing situation. We are watching companion indicators like Gold vs. Palladium, Copper and Industrial Metals for fine tuning as well. One very possible scenario is that the stock bull is not ending but the ‘inflation trade’ of the last several months is. 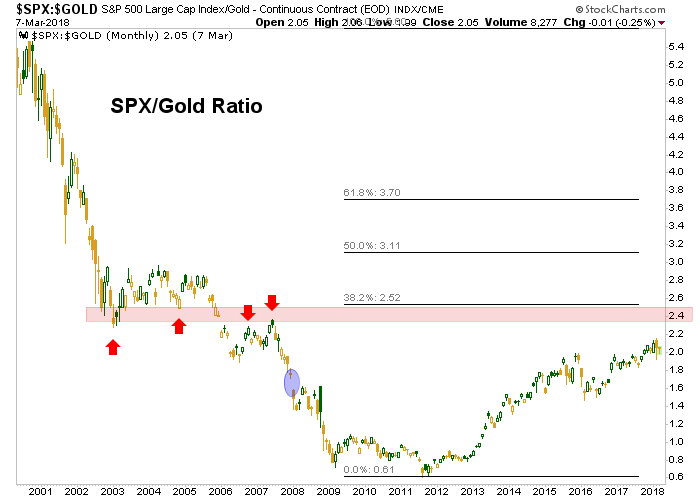 If you get a chance have a look at the GYX/Gold ratio and think about rotation, balance and early warnings. Last but not least is Amigo #3, the yield curve. He’s pretty much the least noticeable one in the picture. I mean, Martin Short compared to Chevy Chase and Steve Martin? Come on… He may not be as noticeable, but he is sure as hell as important, or even more so. The daily view appears constructive for a bounce similar to the Q4 2017 bounce. But on the big picture the curve is still completely in a flattening trend as it flattens with a boom and steepens with economic weakening and eventually, a bust. The 2nd Amigo is the only one to have hit target (and even there the 30yr has a little wiggle room) and the others are still in process. Even if interest rates stall here, the market could simply continue to rotate (as it is currently doing as tech gets the 2018 version of a safety bid I assume due to its lack of inflation sensitivity). The stock market is up trending vs. gold and it may take finer tuned indicators like cyclical metals vs. counter-cyclical gold to give early warnings there. But for now the first Amigo is intact. The yield curve is probably the least sensitive indicator, but maybe the most important because when it changes trend the chart above instructs that based on years of history, it would be time for everyone to get out of the pool polluted by central bankers’ inflationary policy designed to keep asset markets afloat. It would be time to be very careful about what you own and it would be time to own the counter-cyclical metal and its miners (those of relative quality, anyway). This is antithetical to inflationist gold bugs, but it’s the way it is.